THANK YOU whoever it was to decide to give us the option to SAVE OUR DRAFTS OF OUR POSTS!!!! WOW! It really helps, especially because so many times people type big long things and then lose them! Genius idea! How do we delete the drafts though? 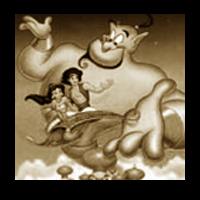 I just put together a new signature showcasing some of my most favorite Disney animated features. Nothing too special, really. Can't believe it has already been more than two years since the DVDizzy forums were reborn out of the ashes. This website is getting old. Geez, even I'm getting old. You be 26 like me and this summer will mark a decade since I've been here... To think I was the tender age of sweet 16 when I first joined where did all that time go? Scary! It will soon be four years since the forum upgrade. However, skimming through this thread makes me somewhat sad as it becomes clear how many forum regulars have disappeared in the meantime. That's saying something, considering that even when this thread was buzzing the forums had already slowed down significantly following the Sitepocalypse. In another thread, somebody said that boards like this one are going to way of the dodo, which surprised me. I had long assumed that lowering traffic here was specific to this site. Hey! If there are any lurkers out there who are reading this, let's have a little get-together. Come leave a message. Just knowing you guys are still around would be pretty comforting. I have never been the most active member, but I'm trying to change that, albeit this current era, many people have forgotten about forums and stuck to Reddit and other social media outlets. I still prefer Forums any day for collecting niches and discussions. Always been a lurker, will continue to be one as long as these boards exist. Really, it's been four years since the sitepocalypse? I remember the just-in-case-emergency-UD-boards... Good times, weirdly? I still lurk!!! And rarely-but-occasionally post! I think this forum is special. I just have been working a lot...I still read Disney news as often as I can, but I just don't have as much time to post it all/my thoughts. My last post before today was on Saturday, January 04, 2014. Today is Friday, April 07, 2017. I originally joined Saturday, October 04, 2008. As of this moment, in terms of members with the most posts, I am #94. Amazing that despite a more than three-year absence, I am still in the top 100 most active users here! For some reason sometime around January 2014, after posting regularly for years, I tried to login one day and was told my password was wrong despite having used the same password for years. But no matter how many times I clicked for an email link to reset my password, it never came. I even returned a few random times over the years and tried again, but no matter what password I tried it was wrong and for some reason the reset link never arrived in my inbox any time I tried to change my password. So I have been locked out for years. Finally though this week I realized DVDizzy has a Facebook page, and I contacted them there, and they reset my password and restored my account! Yaaay Neal!!! I was wondering what had happened to you! Your erudite discussions have been missed. Well, you got 4 out of 5 attributes correct. Yes, in a former life, you and I were friends on Facebook! I have long since deleted that account and began a new one, but you were the only member of this entire forum I remember having connected with outside of this site. Glad to have you back, Neal! It's at the bottom of the home page. It's always been there! Okay, well, somehow I missed that. I went to multiple pages and searched for "contact us"/"contact" and "about us"/"about". I can't say I crawled through the site with a fine-toothed comb, but 99% of sites have a section like those I searched for. I mean, yes, now that you have pointed me in the right direction, I see where the email address is written. BUT am I wrong to say it's not exactly the most obvious spot? It blended into the bottom of the news/updates for me, and my eyes glanced right past to the green links below! I mean, it's not even bolded or italicized or underlined ... same font, text size, color as the news/updates above it. Can you blame me for missing it? OK, this is completely off-topic, but I'm getting a strange, happy sort of feeling after making five consecutive posts on this forum. I haven't posted this much in one go in years! Kind of gives me the feel of old-school UD. Sorry guys for this stupid post but I needed to share. That's good to hear! I hope you keep it up! 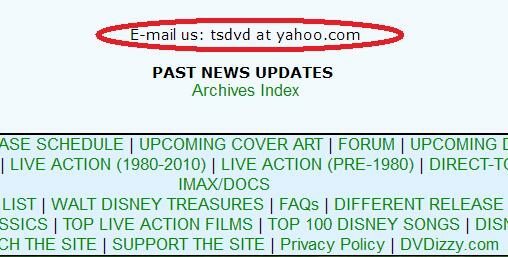 It may be an old forum with its best days behind, but this is still the place I go to for all Disney film news/updates and discussions/opinions. Shout out to Soriris for his devotion! you’re a big part of what keeps this place so great!